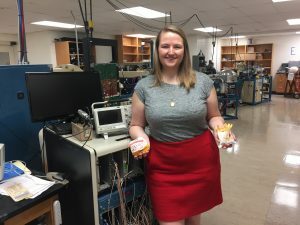 If the fast-food industry ever does away with those crinkly but potentially harmful papers that your favorite burger comes wrapped in, one of the people you can thank is a physics-turned-history-major from Hope College. Senior Margaret Dickinson concluded research on PFAS content in fast food wrappers, such as the ones she is holding, using the Pelletron particle accelerator on Hope’s campus. 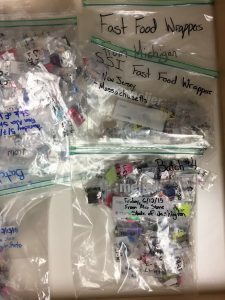 Margaret Dickinson, a senior from Grand Rapids, MI, spent two years at Hope testing hundreds of fast-food wrappers from several states in order to detect per- and polyfluoro alkyl substances (PFAS) in the packaging. Human-made with long environmental lifetimes, PFASs are toxic to humans and animals, and its bioaccumulation is troubling to scientists. Linked to some cancers and health disorders, PFAS is used in products to repel water and retard flames, and has been found in carpet, furniture fabrics, textiles and outdoor clothing, cosmetics, fire-fighting foam, microwave popcorn bags, and, yes, fast-food wrappers. “Around fifty years ago, PFAS was not found in anyone’s blood at all. It did not even exist,” explains Dickinson. “Now it is in measurable quantities in every human being, and that includes newborn babies because it passes through the bloodstream from the mother to the fetus.” PFAS has even reached the blood streams of polar bears in the North Pole. Using the Pelletron particle accelerator on Hope’s campus, under the guidance of Professor Dr. Paul DeYoung and former Hope Professor Dr. Graham Peaslee, Dickinson and fellow senior David Lunderberg, along with alumnus Nick Hubley ’14, used a testing technique called PIGE, particle-induced gamma-ray emission, to detect fluorine in the wrapper samples. But because the paper is fragile and the proton beam from the accelerator is powerful, Dickinson and team had to refine their normal testing methods so as not to destroy their paper samples. It’s good to remember that not all fast-food wrappers have PFAS, she notes, but since you don’t know which do or don’t, the best thing to do is take your food out of their wrappers and containers as soon as possible. The Hope crew’s efforts over two years, in collaboration with other well-known research powerhouses, found that 38% of the sandwich and burger wrappers tested, along with 20% of the paperboard and 56% of the dessert and bread wrappers had PFAS in them. However, 0% of the tested paper cups had PFAS. While skeptics note that consumers aren’t actually ingesting the wrappers themselves (so what’s the harm? ), scientists argue that it is the high temperatures of the food that allows wrapper-holding PFAS to seep into your burger and fries. Other teams contributing to the research were from Silent Spring Institute, Oak Ridge Institute for Science and Education, the U.S. Environmental Protection Agency, California Department of Toxic Substances Control, Green Science Policy Institute, the Environmental Working Group, and Oregon State University. News of their joint research broke in February 2017, and Dickinson reports that over 200 news outlets have since carried the story. So what’s a consumer to do? Give up fast-food? Not all fast-food wrappers have PFAS, Dickinson says, but since you don’t know which ones do or don’t, the best thing to do is take your food out of its wrappers and containers as soon as possible because the greater the exposure to PFAS, the higher the levels in one’s system. Still, “Everything in moderation,” Dickinson reminds. She hopes to eventually teach modern British history at the college level, or even go into scientific governance — the realm of looking at how scientists are affected by policies made by non-scientists. It is here where this fully formed liberal arts student knows she could best apply her experiences in sciences, skills in research, and passion for history and politics to affect others for the better.